Sophomore Maggie Lyon scored 14 points in the Wildcats’ victory over Illinois-Chicago on Sunday. The guard sank two of Northwestern’s five baskets from behind the arc. She was out on the court longer than any of her teammates. Northwestern’s young core took center stage in the season opener against Illinois-Chicago and did not disappoint, leading the Wildcats to a 79-63 victory over the Flames. Coach Joe McKeown decided the best way for his newcomers to learn was from experience, penciling three of his freshmen into the starting lineup. His decision proved to be a good one, as the trio — forward Nia Coffey, guard Christen Inman and guard Ashley Deary — combined for 42 points, eight assists and 11 rebounds. Coffey in particular stood out, dominating the paint with 19 points and five blocks. Although she entered college with an already impressive resume — three state championships, a McDonalds All-American and a FIBA U19 gold medalist — she knows it’s all about the team at NU. The other new faces made strong first impressions. Deary, the 5-foot-4 point guard, had 11 points, six assists and four steals in her debut. She has big shoes to fill, stepping in for junior captain Karly Roser. The Honorable Mention All-Big Ten point guard started all 30 games for the Cats last year and had 188 assists, but Roser is currently sidelined indefinitely with an upper body injury. The story wasn’t all about the freshmen, though. Six Cats scored in the double-digits, including Lyon, the reigning Big Ten Freshman of the Year. Lyon picked up right where she left off, as the guard put up 14 points and six assists, proving she’s not a one-season wonder. 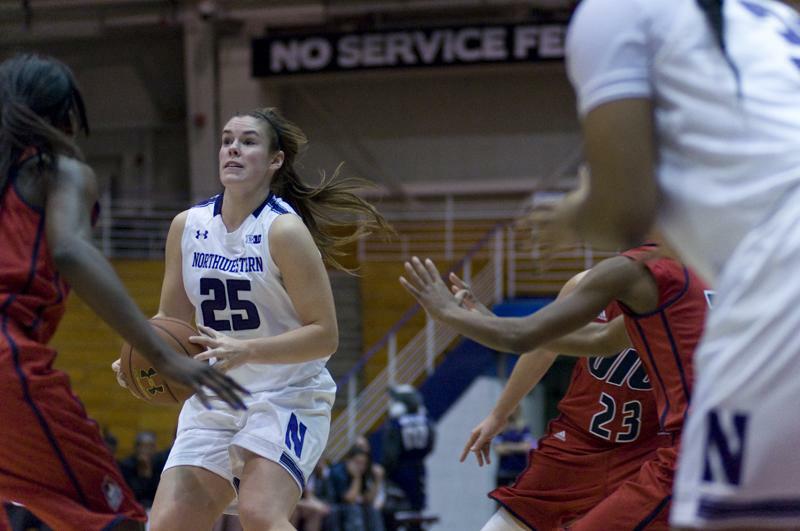 Junior center Alex Cohen and sophomore forward Lauren Douglas also turned in strong performances for NU. Though there was a lot to like from this first showing, there is also room for growth. The Cats played well at times, going on a 25-6 run early in the second half, but also looked sloppy, allowing Illinois-Chicago to tear down its lead from 24 points to 10 late in the game. “Instead of going to the foul line or spreading the floor, we still attacked the basket a little quicker than I wanted to,” McKeown said. Another major issue was fouling. Under the NCAA’s new hand-check rules, whistles blew left and right, and three NU players fouled out of the game. The harsher officiating is something NU must get used to. The Cats aren’t the only ones who will face this problem, however. All across the nation teams are struggling with this rule change. “It’s just gonna take time for teams to get used to playing a certain way,” McKeown said. Nonetheless, NU had an impressive showing in its first outing and showed its possibility for growth. “We have a lot of room for improvement, but I think tonight we really showed that we have a lot a lot of potential,” Lyon said.